Rosa Taikon is getting the price for her firm commitment to respect fundamental human rights. The award recognizes her five-decade long struggle for Roma culture and constitutional rights as well as appreciates her artistic work which enriches the society. "Nicolae has always been such an inspiration! His openness of spirit, his patience and perseverance, and his charisma has been galvanizing more than a generation throughout Europe. I was privileged to work with him at the ODIHR for several years. My sincere condolences to Nicolae's family, my regards to his community and friends. "Finally, the United States notes with a certain sadness that this is the last Human Dimension Implementation Meeting we will have with Nicolae Gheorghe in his capacity as the ODIHR Senior Advisor on Romani issues. There have been many positive changes in the years that Nicolae has been in Warsaw, and in the years since he first played an instrumental role in securing the OSCE’s first reference to Romani human rights in the historic 1990 Copenhagen Document. Nicolae, it has been an honor and a privilege to work with you." I can only join in this." 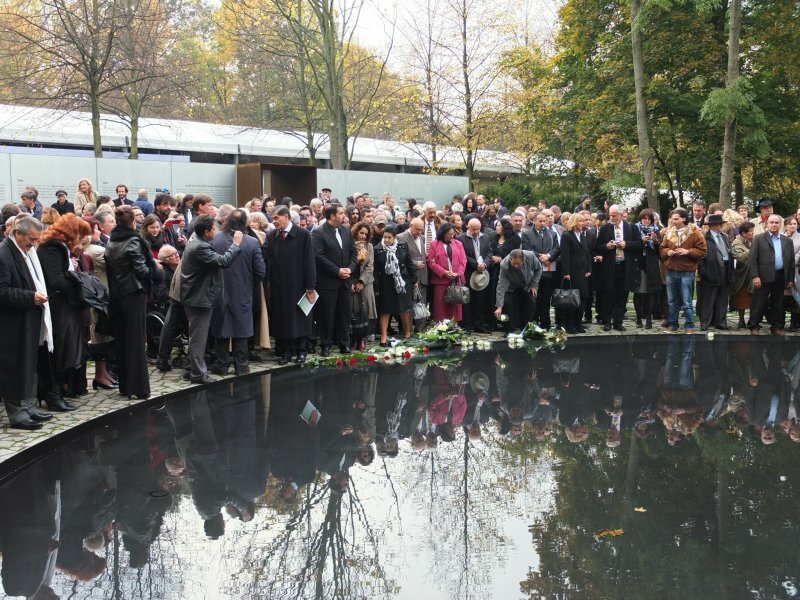 The Inauguration of the Memorial to the Sinti and Roma Murdered Under the National Socialist Regime took place on October 24, 2012 at 11.00. 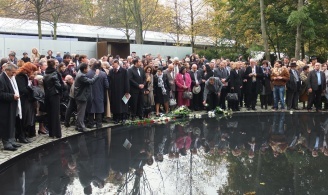 An International crowed formed by the families of the Roma and Sinti survivors’ families, the representatives of Roma organizations and non-Roma supporters of the important and symbolic role of the Memorial took part in the ceremony joining the a distinguished crowed of German political leadership. Ágner Daróczi represented The Romani Elders and emphasized in the interviews she gave to different media representatives the significance of acknowledging the past for fighting the present day discrimination of Roma. ERCF congratulated The Romani Elders for their efforts in promoting the case of the unfinished Memorial, and the artist Dani Karavan indicated that The Romani Elders were not "banging on open doors", and that he felt that the attitude of the involved parties have significantly changed due to the international attention generated by the initiative of The Romani Elders. On the occasion of the Inauguration Memorial to the Murdered Sinti and Roma The Romani Elders advocate for the Draft Resolution for the Recognition of the Roma Holocaust/Samudaripen! During this symposium the relation of art and education was discussed on two levels: the institutional level (the role of art institutions and the 'educational turn' in the art field, alternative and critical pedagogical models in connection with art educational models; student movements and initiatives from the 1960s until today) and on the level of collaboration between artists and young people (interpersonal communication, matters of positioning, knowledge production and mediation, experiencing). ERCF presented The Romani Elders Initiative as an example of effective facilitative mediation, and introduced the „resolutions” the Romani Elders’ initiatives achieved. The European Roma Cultural Foundation -ERCF (www.romacult.org) was informed today about the death of the artist, writer and musician, Ceija Stojka on January 28, 2013. Ceija Stojka was from the Lovari ethnic group the fifth of six children, her sisters of Karl Stojka and Mongo Stojka, were also writers and musicians. Together with her mother and four of the five brothers she survived the Holocaust and the internment at Auschwitz and Bergen-Belsen. Her father in 1941 was deported to the Dachau concentration camp, then he was killed in Schloss Hartheim. In 1943, the whole Stojka family was deported into the Auschwitz Birkenau II. concentration camp, where most of them were executed. 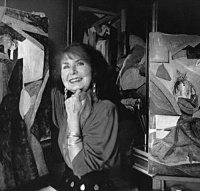 Ceija Stojka survived the Holocaust, but these never forgettable experiences become a central and eternal theme of her artistic work since 1989. Her paintings reflect upon the entrenched sorrow in the bodies and spirit of the victims. There are several books, films and artistic works which are capturing her life. She was a charismatic author and she wrote the first Roma autobiographical account on the Nazi persecution. The book was published in 1988 with the title “We Live in Seclusion: The Memories of a Romni”. It made the European public aware about the struggle of Austrian Roma in the Nazi persecution. Later on in 1992 she published another autobiographical book called: “Reisende auf dieser Welt /"Travellers on This World". Besides painting and writing Ceija also sang in Romanes. In 1989, at the age of 56, Ceija Stojka began to paint. Her work has been exhibited in western and eastern Europe and in Japan. In 2005 the Jewish Museum of Vienna organized an exhibition with the title of „ Ceija Stojka, Leben!”. In 2010 for the first time her artworks have been exhibited in the U.S. Her ars poetica declared: „I always try to portray my feelings and memories. I want to show my own world to the people. It is important to understand that, we are all human beings and art allows us to live and exist. Art can demonstrate and connect us„. Her artistic account offers stories and visual representation of trauma as a new means to face with the past in order to start a new and meaningful dialogue and challenge the various forms of discrimination and violence in the present Europe. Ceija Stoika, was an outstanding Austrian Romani woman, one of the members of The Romani Elders of Europe, and a key figure for the history, art, and literature of Romani culture. She was a role model for the present generation and an inspiration for the future generations of Roma in Europe! During the Council Meeting of The Romani Elders in Berlin on June 1st, 2012 at the Collegium Hungaricum Berlin Nicolae Gheorghe proposed, that The Romani Elders shall draft and disseminate a draft for a European Parliament Resolution on the recognition of the Roma Samudaripen/Holocaust. Read the Draft Proposal for a European Parliament Resolution on the Recognition of the Roma Samudaripen/Holocaust. The simplified version of this Draft Proposal was submitted by several Roma organizations and MEP Lívia Járóka to the European Parliament on August 2, 2012! 8. To promote the dialogue and encounter between survivors of the Holocaust and young people. 9.To preserve, construct and extend memorial sites where Sinti and Roma were tortured and murdered. 10. To strengthen the involvement of Roma organizations in scientific discourses on the Holocaust, politics of memory and Holocaust-education. The citizen’s initiative Perspektive Berlin was established in West Berlin in 1988 in order to erect a memorial in Germany to the Jews murdered during the Holocaust. After the fall of the Wall the initiative started to be supported by the German government, and at the same time it changed its name to the Association for the Establishment of a Memorial to the Murdered Jews of Europe. There were opinions that the memorial should also commemorate other victims of National Socialism, but the final communiqué stated that it would be dedicated to the Murdered Jews of Europe. In 1999, parallel to the Association, the Foundation Memorial to the Murdered Jews of Europe was established, with the mission to build memorials to the other victims of the Nazi regime — homosexuals and the Roma People — as well. But the Memorial to the Sinti and Roma Murdered under National Socialism has still not been built; it is an unfinished construction site in the Tiergarten next to the Reichstag and Brandenburger Tor. The memorial is supposed to be accompanied by information about the Roma and Sinti genocide and about the Nazi camps where Roma were exterminated. The construction of the memorial only began in 2008 and was quite soon stopped because of conflict between Dani Karavan, the memorial’s designer, and the Berlin authority. The unfinished memorial was closed off by a fence and effectively forgotten. In the framework of the 7th Berlin Biennale a Civil Initiative, led by The Romani Elders and coordinated by the European Roma Cultural Foundation – ERCF (www.romacult.org) advocates for the completion of the Memorial to the Sinti and Roma Murdered under the National Socialist Regime. In 1992 after years of demand by the Central Council of German Sinti and Roma, the German Federal Government decided upon the construction of a Memorial to the Sinti and Roma Murdered under the National Socialist Regime. Today — twenty years after the decision — it remains an abandoned building site in the middle of Berlin. ERCF is committed to generating a wide network of Roma and non-Roma organizations and individuals throughout Europe and is collecting their signatures in order to make an effort to impose pressure on all participants — including the political sphere, the official authorities, the construction team, and the artist — for the continuation of the building process. The Roma community aims to communicate the urgent need to finally finish the memorial in order to celebrate in dignity the inauguration together with the handful of survivors and their families. The Civil Initiative began with the dissemination and promotion of a Call for Unity. On June 2, 2012 the Romani Elders and the representatives of the younger generation of Roma activism assembled to make their public statements in front of the memorial. It is the main objective of the Initiative to carve the memory of the Sinti and Roma victims into the European collective memory. The Romani Elders and the Roma community will complete their mission if the disputing parties look beyond their ego-wars, recognize what is really important in this project, and agree to promptly continue the building process until the memorial site is open to the public. We believe it is essential to commemorate the Sinti and Roma victims of the Holocaust and place them in history in order to acknowledge the continuing attacks towards the Roma throughout Europe today. 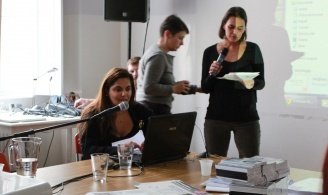 Following the invitation of Artur Żmijewski the European Roma Cultural Foundation – ERCF curated a comprehensive archive: theromanielders.org. The Romani Elders initiative builds on the achievements of The Romani Elders, who spent a lifetime in Romani activism. ERCF wishes to ensure that their achievements will never be neglected or forgotten, and their wisdom is re-invested in our societies. We feel that the knowledge, experience, and achievements of the Roma community’s Elders are not explored or collected. ERCF and it’s generation of Roma intellectuals wishes to give their role models the attention and respect they deserve. The European Roma Cultural Foundation – ERCF is an independent non-profit foundation registered in Budapest, Hungary. The European Roma Cultural Foundation, the operational and fundraising body, exists to strengthen and widely promote the role of Roma arts and culture in the enlarging Europe (and beyond) as a way to fight against negative stereotypes and hostile attitudes towards Roma communities. Join the initiative of ‘The Romani Elders’ and ERCF with your signature!